I used to think I was almost perfect. I didn’t think I was better than absolutely everyone, but I thought I was better than everyone who was living in obvious sin. Then, at age 17, in high school, I got pregnant. I remember the night I found out. It was the scariest feeling ever. I never thought this would happen. I was the “good girl” … I went to church. I sang in choirs growing up. I went to church youth camp. I raised my hands in church… but I was living a lie. When I was at home, I was very rebellious, and my sin found me out. I sat down with my mom and told her I was pregnant. It was the hardest thing I had ever done. She was so upset. She went and told my dad. My dad came and threw my phone into my hope chest and broke it. Then he called our pastor, and our pastor came over. (Boy, was that ever fun.) It was a nightmare. My parents told me that I was going to have an abortion. I was 17 and living under their roof, and I had no choice. 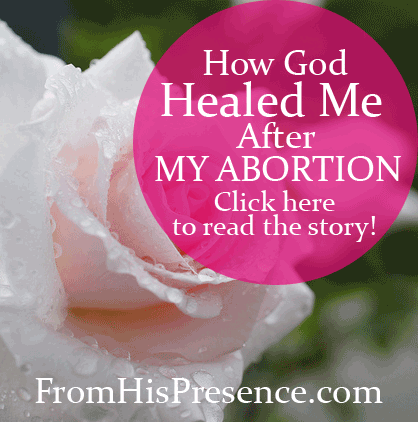 I had an abortion at 17 years old. I grew up and got married. But I never forgot my baby, and I was hurting. When I was 26 years old, I went to my doctor. He saw how depressed I was, and he asked me about it. I admitted to him what had happened all those years ago, and he sent me to counseling. The counseling program I went to lasted six weeks. During this time, we went through a workbook, and we each told our stories. We also named our children at the end of the six weeks. Counseling really helped, because you find out that you are not the only one. There are many other women out there that are feeling the same way. YOU ARE NOT ALONE. I know you feel that way, but you aren’t. At the end of our six weeks of counseling, we had a ceremony. During the ceremony, someone came up to me who is very well-respected. He got in my face and said, “Don’t EVER think God can’t use you.” I have not forgotten that. It has taken several years, but God has brought me through this. Do I feel sad when it is mentioned on the news and in church all these years later? Yes; it brings back terrible memories. But it has also shown me what God has brought me out of, and what He has given me even though I messed up. I do not blame my parents or hold a grudge. I am sorry for what I did. But I have asked God to forgive me, and I know He has. None of us are perfect. Nobody. But the good news is that God is loving and forgiving, no matter what you have done. KNOW THIS: If you have asked God to forgive you and you truly mean it, He has forgiven you and has forgotten it. If you try to bring it up again later, HE does not know what you are talking about. He forgives completely. The hardest person to forgive is yourself, but God is able to heal you. Ask God to help you forgive you, and He will. Image courtesy of T. Kiya on Flickr. Sometimes I feel I will always love with the regret,hurt and shame.You see,my story is different. I was already married and a “christian” mother of 2 when I had an abortion.I won’t make excuses for it.It was plain selfishness on my part.I came to regret my decision and suffer the consequences as well.I started suffering from insomnia,anxiety,depression and panic attacks.After those symptoms subsided a bit,my husband and I decided we did want more children and so we decided we would try.After 2 years I became pregnant but it ended up being an ectopic pregnancy and I lost my baby and my right tube.We felt as though God was punishing us for what I did.Its been 4 years since that and I’ve not been able to conceive. My oldest son came to me and confessed he has been praying and asking the Lord for a baby sister for a few years now.Imagine the gulit and shame I carry for robbing not just myself but my husband and children of such a blessing. I recently turned 40 and I really do wonder if I will ever be free in this life.Its such a heavy burden.Hes almost an adult and he continues to tell me he is praying.I don’t know what to say or do anymore.Is there any advice you could give me?I have been praying but I don’t have an answer as to what I need to do and what God’s will is. Hi sweet sister. I’m sorry you’ve been going through such a hard time. But please know this: If you have confessed and repented of your sin, then God has forgiven you. 1 John 1:9 says, “If we confess our sins, He is faithful and just to forgive us our sins, and to cleanse us from all unrighteousness.” If you have not confessed and repented of the abortion, then you’ll definitely want to do that. But if you have, then God has forgotten all about it. He has removed it from you as far as the east is from the west. I know that it’s a hard memory to heal from. I would encourage you to find a local, Christian post-abortion Bible study group and walk through a recovery group with other women. It doesn’t matter how long ago it was. That group will be very healing to you. Much love and I will be praying for you.